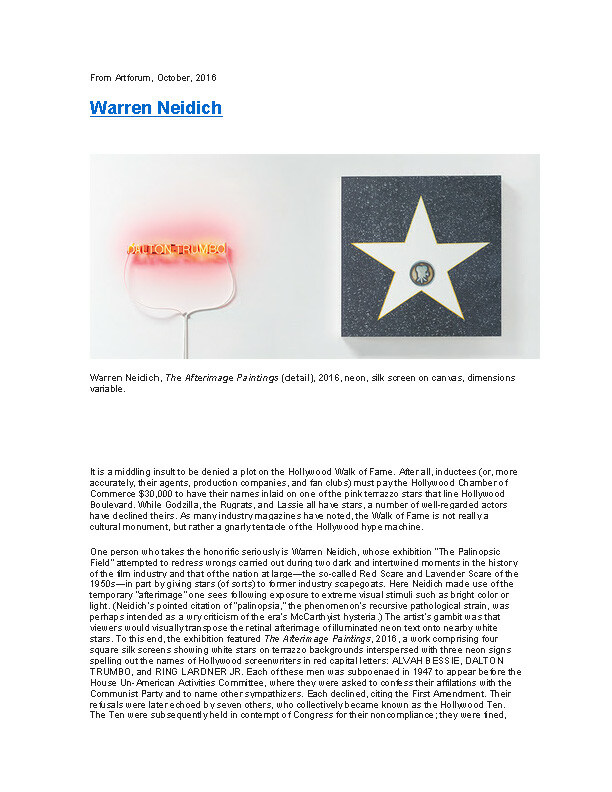 One person who takes the honorific seriously is Warren Neidich, whose exhibition “The Palinopsic Field” attempted to redress wrongs carried out during two dark and intertwined moments in the history of the film industry and that of the nation at large—the so-called Red Scare and Lavender Scare of the 1950s—in part by giving stars (of sorts) to former industry scapegoats. Here Neidich made use of the temporary “afterimage” one sees following exposure to extreme visual stimuli such as bright color or light. (Neidich’s pointed citation of “palinopsia,” the phenomenon’s recursive pathological strain, was perhaps intended as a wry criticism of the era’s McCarthyist hysteria.) The artist’s gambit was that viewers would visually transpose the retinal afterimage of illuminated neon text onto nearby white stars. To this end, the exhibition featured The Afterimage Paintings, 2016, a work comprising four square silk screens showing white stars on terrazzo backgrounds interspersed with three neon signs spelling out the names of Hollywood screenwriters in red capital letters: ALVAH BESSIE, DALTON TRUMBO, and RING LARDNER JR. Each of these men was subpoenaed in 1947 to appear before the House Un-American Activities Committee, where they were asked to confess their affilations with the Communist Party and to name other sympathizers. Each declined, citing the First Amendment. Their refusals were later echoed by seven others, who collectively became known as the Hollywood Ten. The Ten were subsequently held in contempt of Congress for their noncompliance; they were fined, jailed, and blacklisted by the major motion-picture studios. Dalton Trumbo, perhaps the best known of the group, went on to ghostwrite the films Exodus and Spartacus (both 1960), as well as Roman Holiday (1953), for which he was retroactively credited in 2011. Given that Nathan Lane, Tim Robbins, and Ed Harris, each of whom has played Trumbo in theatrical depictions of his life, all have Walk of Fame stars, Neidich’s corrective gesture was fitting, if tinged with irony. The bestowal, however, lasted only as long as the afterimage burned within the viewer’s eye. Standing in front of this wall-mounted series was Neidich’s Archive of False Accusations, 2015–16, a set of two glass display cases whose long, flat beds were rimmed with purple neon. These vitrines housed an assortment of facsimiles of articles concerning the Lavender Scare, named for the McCarthy-inspired campaign to root out purported homosexuals working within the federal government. This crusade was coterminous with its Red counterpart and frequently lumped Hollywood stars with government workers in its efforts to paint homosexuals as Communist sympathizers. The headlines of the articles, which Neidich culled from University of California’s one National Gay and Lesbian Archives, describe this campaign with cogency: 126 PERVERTS DISCHARGED; CONGRESS HEARS 500 PERVERTS INFEST CAPITAL; AND SENATORS SEEK MORALS CLEANUP IN GOVERNMENT. Neidich’s flat-footed presentation of archival curiosities may by now be a standard didactic artistic strategy, but his installation additionally demonstrated the perils of peering too closely at traumatic historical records: If you inadvertently shifted your focus to the glowing edge of the vitrine, your vision was impaired, your retinas flooded with lavender.